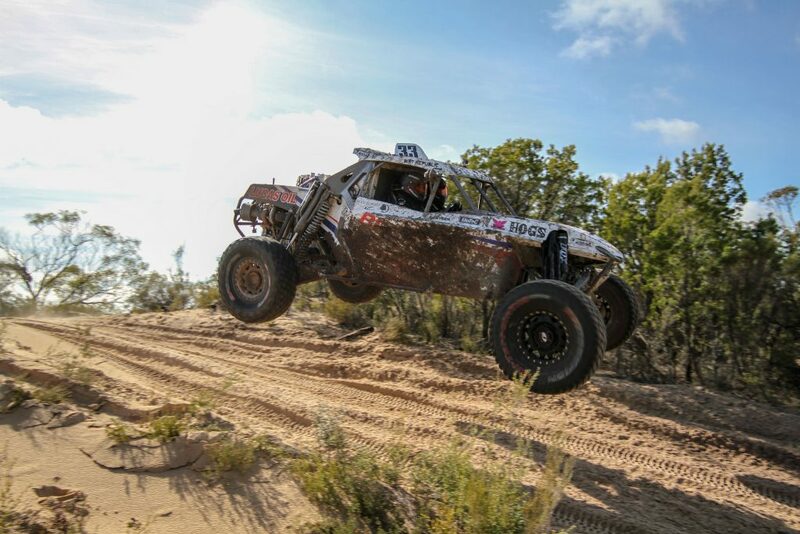 Competitors at round three of the 2018 BFGoodrich CAMS Australian Off Road Championship have rated the challenge of the Hindmarsh Shire Rainbow Desert Enduro event up there with the iconic Finke Desert Race. In its second year, the Rainbow Desert Enduro again threw everything at the field, the varying terrain of the 75km course and the changeable weather throwing curve ball after curve ball at competitors. Organisers of the event, the Victorian Off Road Racing Association (VORRA), have always touted it as a true endurance event, something eventual event winner and 2018 Australian Off Road Champion Shannon Rentsch recognised and prepared for. “A lot of prep has gone into making sure the car is right,” he said before the event. Competitors completed prologue and a two-lap race on Saturday before lining up for a five-lap showdown on Sunday, a gruelling 525-kilometres over two days. New-comer to the Rainbow Desert Enduro Mick Magher, who finished the race sixth outright and third in the highly competitive Extreme 2WD class, posted on Facebook, “Finke was rough but Rainbow was rougher”. The Victorian, who pilots the Narva Australia TSCO Racing Trophy Truck, explained further by saying: “It was tougher than Finke and the truck loved it. The whoops through the sandy desert sections had real square edges, so you had to push hard to get on top of them. Second outright and first in Extreme 2WD, Outer Bounds Racing’s Beau Robinson was a little surprised by the challenges faced at Rainbow. “Towards the end there it actually became really rough, probably one of the roughest places we have been to,” Robinson said post race. Overwhelmingly, it was a big thumbs up from the competing crews, and summed up perfectly by Moneybox Racing pilot Alan Dixon, who wrapped up the Prolite class title and the Victorian Off Road Championship at Rainbow.